This article is about the first game. For information on the direct sequel, see Warriors Orochi 2. Warriors Orochi (無双オロチ, Musō Orochi) is a beat 'em up video game for PlayStation 2 and Xbox 360, developed by Koei and Omega Force. It is a crossover of two of Koei's popular video game series, Dynasty Warriors and Samurai Warriors (specifically Dynasty Warriors 5 and Samurai Warriors 2) and the first title in the Warriors Orochi series. The game was released on March 21, 2007, in Japan, September 18 in North America, September 21 in Europe, September 27 in Australia and September 28 in New Zealand. The game came out for the Xbox 360 in Japan on September 13, and the European version came out on the same date as the PlayStation 2 version in the North America. The game was ported to the PlayStation Portable, released in Japan on February 2008, March 25 in North America, and March 28 in Europe. A PC version was released in North America on March 25, 2008. The fictional events of the game begin when the Serpent King Orochi created a rift in time and space. By creating a twisted new world and bringing together warriors from the Three Kingdoms era of China and the Warring States period of Japan (more than 1,000 years apart in history), Orochi wished to test the might of the warriors of these two eras. In the Shu Han story, the Shu forces were in shambles after their battle with Orochi. Many Shu officers were captured by Orochi, went missing, or joined other forces. Zhao Yun was captured by Orochi's forces and held prisoner in Ueda Castle. He is later rescued by Zuo Ci, Yoshihiro Shimazu and Xing Cai. Zuo Ci revealed startling news to Zhao Yun, which led him to embark upon a quest with help from unexpected allies. In the Kingdom of Wei story, Cao Cao had disappeared in his battle against Orochi's forces. His son, Cao Pi, took up leadership of the Wei clan and allied himself with Orochi, under the offer sent by his strategist, Da Ji. There were a few Wei officers who refused to surrender, or ended up joining other forces opposing Orochi. Under the new alliance, Orochi orders Cao Pi to suppress all those who oppose him. Though Cao Pi obediently obeys Orochi's every command, he has an ulterior motive that he is planning as the story progresses. In the Kingdom of Wu story, Orochi uses the captive Sun Jian and other Wu officers to blackmail the Sun family into servitude. Orochi demanded that rebel leaders and officers be turned over in exchange for the release of the captives. Sun Ce is the first to rebel against Orochi, under the guidance of Sakon Shima, and much to the disapproval of his siblings, Quan and Shang Xiang. In this story, Nobunaga Oda, Shingen Takeda, and Kenshin Uesugi each maintained a resistance force against Orochi's army. Even in this most dire of circumstances, the three daimyōs refuse to work together against Orochi. Each of them were focused on assimilating smaller resistance forces spread throughout the land into their own forces. The Orochi Army consists of pale-skinned troops that behave similarly to regular troops of the protagonist forces. Several major characters from both Dynasty Warriors and Samurai Warriors either aligned themselves or were subverted by Orochi, fighting in his name. Orochi's main headquarters is at Koshi Castle, where the final confrontation takes place for all four stories in the game. In the original Japanese version, the Orochi officers are named after various legendary monsters (youkai) in both Chinese and Japanese folklores, while the English version has them named after various species of snakes (using their common names) as a pun to Orochi being the Serpent King. The Orochi officers all share the same character model, and are unplayable enemy characters. 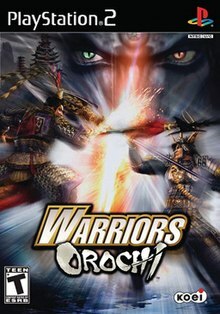 A total of 79 characters encompasses the roster of Warriors Orochi: 48 from Dynasty Warriors, 29 from Samurai Warriors (including Yoshimoto Imagawa, Kunoichi and Goemon Ishikawa from the first Samurai Warriors, left out in its sequel), and two new characters: the titular character and primary villain, Orochi (远吕智/八歧大蛇) the Serpent King and the mythological beast of Yamato; and Da Ji (妲己), the villainous concubine of King Zhou of Shang from Fengshen Yanyi. Orochi wields a very large scythe, named "Eternal Agony", while Da Ji fights with two floating orbs, called "the Orbs of Ruin". There are many generic, non-playable officers who are also part of the game, all taken from the Samurai Warriors and Dynasty Warriors games. There are also exclusive non-playable officers that are in Orochi's forces. Players can take any three characters from the Dynasty and Samurai Warriors lineup into battle, forming a party, as seen in Marvel vs. Capcom. Players can switch between the characters in their party any time during battle. Those that are inactive are invisible, during which their health and Musou energy regenerate. If one character is defeated, the game ends in defeat, even if the player's other two characters are still intact. All characters are grouped into one of the following character classes: Power, Technique and Speed. The first type hits hard and relatively (but not completely) slow; the second type demonstrates more "fancy" fighting moves with moderate strength and speed, and is able to perform a "counter-strike"; the third type usually attacks and moves faster than the previous two types, and is the only type that can double jump (see below). All characters have a new move called an Enhanced Strike. This move consumes Musou energy with all Power characters and sometimes with characters of other classes, and varies by character and their class. All characters have specific personal items that can be acquired by completing character-specific objectives. This also unlocks special features. These replace the final weapons of previous games, which had similar requirements, but are only another more powerful weapon in the game. Weapon improvements are performed with the new Weapon Fusion system. Players can combine attributes of multiple weapons of one character into one more powerful weapon. Character selection screen: Dynasty Warriors characters are divided by their respective kingdoms. Samurai Warriors characters are divided by which game they made their first appearance. Correct pronunciation of names: Unlike the Dynasty Warriors games, the English-language version of Warriors Orochi utilizes the correct pronunciations of certain Three Kingdoms officers. The best example is Cao Cao, who in Dynasty Warriors is pronounced as "cow cow". Cao Cao is now "ts'au ts'au" following traditional Chinese pronunciation. This new pronunciation method also applies for Cao Pi, Cao Ren, and Xing Cai. Art gallery: Showcases CG art and trailers from past Warriors games. Trailers are removed from the US PlayStation 2, Xbox 360, PSP and PC versions. Chaos difficulty: This highest difficulty level is available in Warriors Orochi at the start. Dynasty Warriors 5 and Samurai Warriors 2, in comparison, offered the Chaos difficulty only after completing special requirements. Game soundtrack: Composed of the original music from both Dynasty Warriors' rock-based soundtrack and Samurai Warriors' techno-based soundtrack. A few new songs were created exclusively for Warriors Orochi. Lu Bu's theme song is given a rearrangement combining both rock and techno music styles. Multiplayer: Player 2 uses same team as Player 1, albeit with a swapped palette. Game stages: Recycles stages from both games, some of which are modified by Orochi's supernatural influence. Such stages have burnt ground and 16th-century Japanese buildings placed on some Dynasty Warriors stages. Koshi Castle, a stage made exclusively for this game, is the location of the final battle against Orochi for all stories. Equipment: Abilities acquired by characters during the game are equipped, as seen in Samurai Warriors 2. Using an element from the first Samurai Warriors game, a limit is placed on the number of Abilities equipped at one time. Camera control: Players are given complete control over the game camera, similar to Samurai Warriors 2. Special attacks: Following Samurai Warriors 2 to an extent, characters perform their own Enhanced Strikes, varied by characters and their classes. Weapon deadlocks: No indication as to which character holds the advantage during a deadlock, following Dynasty Warriors 5. In Samurai Warriors 2, a tug-of-war-style bar is displayed during a deadlock, indicating which character holds the advantage. Double jumps: Expands on the concept of Samurai Warriors 2. All Speed-class characters in Warriors Orochi can perform an Aerial Thrust, which keeps them in the air but propels them forward (or in a given direction as per player control); this can be used for example to avoid certain attacks or to reposition on the fly. Additional attacks: This is the ability for characters to perform hits beyond the standard six. Characters in Warriors Orochi gain this ability with experience, following Samurai Warriors. Dynasty Warriors characters also gain an additional three attacks after their regular combo once they reach a high proficiency; the attacks are the same as the "Evolution" attacks from the Dynasty Warriors PSP games. Fourth weapons: These are the most powerful weapons a character can possess. They are obtained in Hard mode on a stage rated 3-stars or higher, or any stage in Chaos mode. Fourth weapons contain random elements. Lu Bu and Tadakatsu Honda possess the strongest of those weapons, both with Strength values up to 100. Calling horses: An ability exclusive to Yukimura Sanada and Keiji Maeda in Samurai Warriors 2, any character can perform this ability in Warriors Orochi. If the player character(s) did not start the game on horseback, however, s/he will be only able to call a low-level steed. Special mounts: Only the Red Hare from Dynasty Warriors 5 and Matsukaze from Samurai Warriors 2 are present when a player acquires a Level 10 Cavalier ability in the game. They can also be found mid-game by defeating either a mounted Lu Bu or Maeda Keiji. Facial expressions: All characters, including the Dynasty Warriors characters, display different facial expressions in their in-game avatar when speaking, following Samurai Warriors 2. Base captains: Following Samurai Warriors 2, base captains carry shields, allowing them to withstand several hits before taking damage. Objectives: Following Dynasty Warriors 5, some stages have certain objectives that, if completed successfully, greatly help the player in winning the stage. Not implemented is a feature from Samurai Warriors 2, which awards the player additional gold if objectives are completed successfully. Musou Rage from Dynasty Warriors 5. Musou refill from attacking Dynasty Warriors 5. Use of bow and arrow from Dynasty Warriors 5 (except the character that already had bow as weapon). Bodyguards from Dynasty Warriors 5. Dodge Roll from Samurai Warriors 2. Special Stances from Samurai Warriors 2. They are included in Warriors Orochi as Enhanced Strikes. Multi-tiered Musou Gauges from Samurai Warriors 2. Counter Attack (performed on the PlayStation 2 version by holding the guard button and pressing the charge button) from Dynasty Warriors 5. Only Technique-type characters can counterattack by pressing the R1 button (PlayStation 2 version) when attacked. The Double Jump ability of the ninjas from Samurai Warriors 2, although characters with the speed abilities can jump forward after the first normal jump. Warriors Orochi was met with average to very mixed reception. GameRankings and Metacritic gave it a score of 65% and 62 out of 100 for the PSP version; 57% and 53 out of 100 for the Xbox 360 version; 54% and 55 out of 100 for the PlayStation 2 version; and 52% and 51 out of 100 for the PC version. As of May 21, 2008, the game sold over 1.5 million units worldwide. ^ "Article Detail - PlayStation Portable News - PSP Updates". Archived from the original on November 30, 2007. Retrieved November 28, 2007. ^ Sterling, Jim (April 2, 2008). "Destructoid review: Warriors Orochi (PSP)". Destructoid. Retrieved August 10, 2014. ^ McCarthy, Dave (October 3, 2007). "Warriors Orochi (X360)". Eurogamer. Retrieved August 10, 2014. ^ a b Reeves, Ben (October 2007). "Warriors Orochi (X360, PS2)". Game Informer. No. 174. p. 113. Archived from the original on February 3, 2009. Retrieved August 10, 2014. ^ Erickson, Tracy (September 19, 2007). "Review: Warriors Orochi (PS2)". GamePro. Archived from the original on October 5, 2007. Retrieved August 10, 2014. ^ Hunt, Geoff (October 11, 2007). "Warriors Orochi Review (X360)". Game Revolution. Retrieved August 10, 2014. ^ a b Navarro, Alex (September 27, 2007). "Warriors Orochi Review (X360, PS2)". GameSpot. Retrieved August 10, 2014. ^ Anderson, Lark (April 4, 2008). "Warriors Orochi Review (PSP)". GameSpot. Retrieved August 10, 2014. ^ Theobald, Phil (March 26, 2008). "GameSpy: Warriors Orochi (PSP)". GameSpy. Retrieved August 10, 2014. ^ a b "Warriors Orochi Review (PS2, X360)". GameTrailers. September 26, 2007. Retrieved August 10, 2014. ^ Romano, Natalie (March 30, 2008). "Warriors Orochi - PSP - Review". GameZone. Archived from the original on October 7, 2008. Retrieved August 10, 2014. ^ Grabowski, Dakota (October 1, 2007). "Warriors Orochi Review - Xbox 360". GameZone. Archived from the original on October 7, 2008. Retrieved August 10, 2014. ^ Clements, Ryan (March 26, 2008). "Warriors Orochi Review (PC)". IGN. Retrieved August 10, 2014. ^ Clements, Ryan (September 18, 2007). "Warriors Orochi Review (PS2)". IGN. Retrieved August 10, 2014. ^ Clements, Ryan (March 24, 2008). "Warriors Orochi Review (PSP)". IGN. Retrieved August 10, 2014. ^ Clements, Ryan (September 19, 2007). "Warriors Orochi Review (X360)". IGN. Retrieved August 10, 2014. ^ "Warriors Orochi". Official Xbox Magazine. November 2007. p. 99. ^ "Warriors Orochi". PC Gamer. July 2008. p. 70. ^ a b "Warriors Orochi for PC". GameRankings. Retrieved August 10, 2014. ^ a b "Warriors Orochi for PlayStation 2". GameRankings. Retrieved August 10, 2014. ^ a b "Warriors Orochi for PSP". GameRankings. Retrieved August 10, 2014. ^ a b "Warriors Orochi for Xbox 360". GameRankings. Retrieved August 10, 2014. ^ a b "Warriors Orochi for PC Reviews". Metacritic. Retrieved August 10, 2014. ^ a b "Warriors Orochi for PlayStation 2 Reviews". Metacritic. Retrieved August 10, 2014. ^ a b "Warriors Orochi for PSP Reviews". Metacritic. Retrieved August 10, 2014. ^ a b "Warriors Orochi for Xbox 360 Reviews". Metacritic. Retrieved August 10, 2014. ^ IGN staff (May 21, 2008). "KOEI Ships Over 1.5 Million Units Worldwide of Warriors Orochi". IGN. Retrieved August 10, 2014. This page was last edited on 14 February 2019, at 00:45 (UTC).